With a stay at Holiday Inn Express Hotel and Suites St. Charles in St. Charles, you'll be in the historical district and close to Jaycee Park and Lindenwood University. This hotel is within close proximity of Katy Trail and Historic Main Street. Make yourself at home in one of the 73 air-conditioned rooms featuring refrigerators and microwaves. Wired and wireless Internet access is complimentary, while 32-inch flat-screen televisions with cable programming provide entertainment. Conveniences include coffee/tea makers and irons/ironing boards, as well as phones with free local calls. 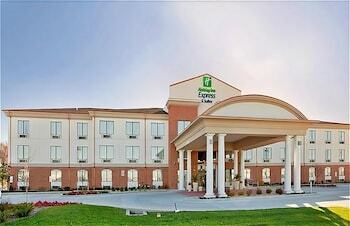 Holiday Inn Express & Suites St Charles is an ideal St Charles lodging choice for your trip to Missouri. With numerous amenities for guests such as fitness center, atm machine, laundry, you will wake up at Holiday Inn Express & Suites St Charles feeling refreshed every day for your time in St Charles. Don’t let this amazing reservation opportunity pass you by, book your stay at Holiday Inn Express & Suites St Charles today to make the most of your time in St Charles, Missouri.